mAadhaar is a mobile app from UIDAI or Unique Identification Authority of India on which a person can download his/her Aadhaar Card. In just 2 months 10 lakh people have downloaded mAadhaar. In just 2 months 10 lakh people have downloaded mAadhaar, thus making it a very popular App among the users. This was shared on Twitter by Union Minister For Electronics & IT, Ravi Shankar Prasad. Effective from 8th September 2017, the Railways allowed m-Aadhaar as one of the proofs of identity for rail travel. mAadhaar is a mobile app from UIDAI or Unique Identification Authority of India on which a person can download his/her Aadhaar Card. For showing Aadhaar, the person undertaking the train journey, has to open the app and enter his/her password to show the Aaadhar Card on the smartphone. However, it can be done only on the mobile number to which Aadhaar has been linked. 2) Please note that your Aadhaar profile on mAadhaar can be downloaded only on mobile devices where your mobile number is linked with your Aadhaar. 3) mAadhaar will automatically read the OTP once it is received. 4) mAadhaar needs to connect and download data from UIDAI. So ensure that internet connectivity is available on your phone. 5) One Aadhaar profile can be active on only one device at a time. If you create profile on another device by inserting the SIM in another device, the previous profile would become inactive and would be deleted from older device whenever any operation is attempted from that device. 6) If members of your family have the same mobile number registered as yours in their Aadhaar, you can add their profile in your device. 7) A user can add maximum 3 profiles in his device, all having same mobile number registered in their Aadhaar. 8) Biometric locking/unlocking - This is a mechanism to secure your biometric authentication by locking biometrics data. Once you enable biometric locking system, then the biometric details remains locked till the Aadhaar holder chooses to either unlock it (which is temporary) or disable the locking system. 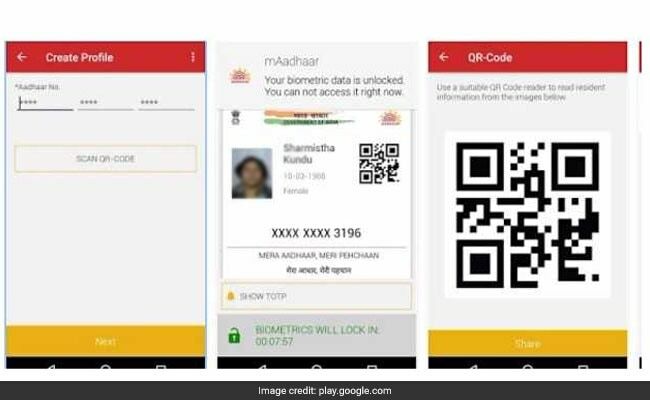 9) Sharing of QR code and eKYC data by Aadhaar Number holder - Users can share QR code and password protected eKYC data to retrieve accurate demographic information from it instead of manual entry. 10) TOTP generation - Time-based One-Time Password is an automatically generated temporary password which can be used instead of SMS-based OTP.